Farmer Peter Mutegi, who practices conservation farming, with his crop in Giakuri, Kenya, on January 23, 2019. Kamatungu, Kenya — As Mary Mbaka tended to the crops on her farm in central Kenya, she wondered if she could rely on recent heavy rains to keep them watered, or if she should be preparing for a dry spell. "The weather is quite unpredictable," she said. Accurate forecasts "would be of great use to me", Mbaka told the Thomson Reuters Foundation. But about a third of the country's farmers do not use the national weather service to help them plan and protect their crops, according to Danson Kigoro Ireri, director of meteorological services in Tharaka Nithi County. "Most farmers are still not ready to take up the accurate scientific information conveyed by the met department," he said. Farmers, who make up nearly 40 percent of Kenya's working population, leave themselves vulnerable to the potentially devastating effects of extreme weather by relying solely on traditional prediction methods, said Ireri. "It's a problem that cuts across nearly all the counties," Ireri said. "I am only ever told about a vast region, and I don't know what to do with that," she said. She needs information that will help her know if her area will get sufficient rain or is facing a prolonged dry period - "so I can be in a position to plan". 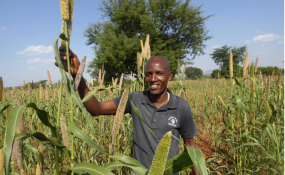 When farmers do decide to try using the meteorological service, one inaccurate forecast is enough to turn them off for good, said Lawrence Marangu, local coordinator for the government's Agricultural Sector Development Support Programme. "The information might come too early or the weather might not necessarily be what was predicted," he said. "Farmers ... tend to believe their traditional forecasts more than the met (office)." "I have been farming all my life and I often do not agree with much of what they advocate," he said. "I won't allow them to dictate to me what to plant and what not to plant."